Everywhere there are beans. Everywhere I look in the garden the bean plants are scrambling over everything. They have covered the sunflowers, the corn and every inch of the supports built to hold them. Homer had to rebuild the bean supports to keep the beans happy. The weight of all the bean plants pulled the original, twine based foundation almost to the ground. Heavy gauge wire had to be run across the top to support the bean vines. We have grown two kinds of beans this year. Rattlesnake, which grow with a purple color and in great bunches that make them easy to find on the vine. And Kentucky Wonder, that are solid green just like the leaves and not so easy to find. Some picking days it is like hide and seek out there. 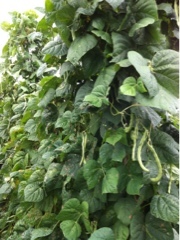 When the beans get big they can be kept and dried to be used some other time in the year. We did that last year and loved soaking beans in our chicken broth. Fresh big beans in chicken broth with a ham bone in there has been the perfect meal for the last couple of days. The temperature outdoors dropped by about 40 degrees, and some warm deliciousness waiting on the stove has been most welcome. The three flavors combine to be pure comfort.